Armed with approval to introduce service from Houston Intercontinental to three markets in Mexico, Spirit Airlines has the potential to create a new layer of competitive dynamics in the market as Southwest prepares to add international flights from a new terminal at Houston Hobby in late 2015. Spirit has not formally announced the launch of new international flights from Houston Intercontinental; but its moves to secure authority for service to Mexico show that it aims to position itself as a formidable competitor to Southwest and legacy airlines alike. Spirit’s work to gain approval for the new service to Mexico is within the framework of a bilateral that limits the number of airlines on specific routes, so Spirit may be attempting to secure a place in key leisure markets as Southwest plots its international strategy from Houston. During Sep-2014 Spirit sought approval from the US Department of Transportation (DoT) to launch service from Houston Intercontinental to Cancun, Los Cabos and Toluca, Mexico. The airline has served those markets from elsewhere in its network including Fort Lauderdale, San Diego and Dallas/chFort Worth. 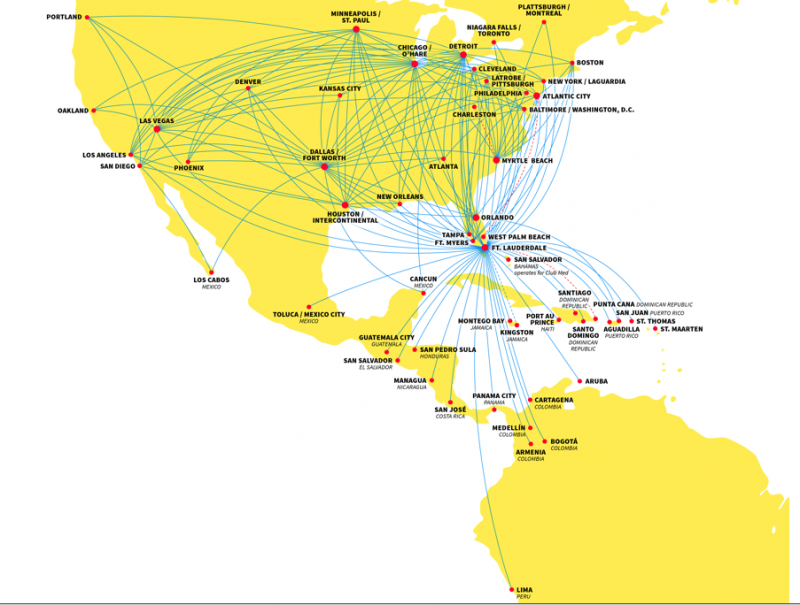 Fort Lauderdale remains Spirit’s largest international gateway from the US to the Caribbean and Latin America; but during the last couple of years Spirit has opted to launch transborder service from other points in its network. The potential service from Houston would be Spirit’s first international routes from the market. Spirit entered the Houston market in late 2012 and presently (13-Oct-2014 to 19-Oct-2014 offers service to Atlanta, Chicago O’Hare, Denver, Fort Lauderdale, Detroit, San Diego, Kansas City, New Orleans, Las Vegas, Orlando, Los Angeles and Minneapolis. 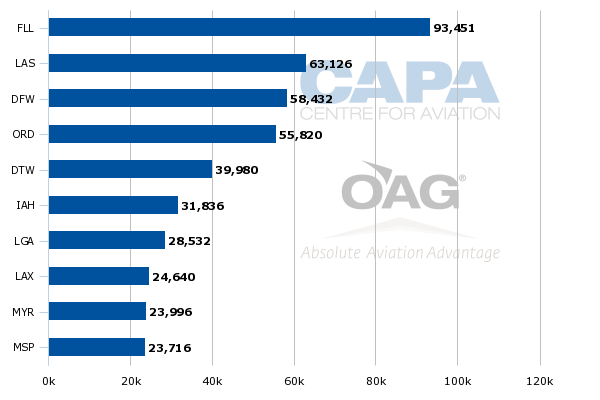 Based on data from CAPA and OAG for the week of 13-Oct-2014 to 19-Oct-2014, Houston is Spirit’s sixth largest base measured by seat deployment. In its request with the DoT to gain approval for the new service to Mexico, Spirit stated that under the current Mexico-US bilateral agreement, the US is permitted to designate up to three airlines to serve Cancun and Los Cabos from Houston, and two airlines to serve Toluca. Presently, there are two designations available from Cancun to Houston, with United holding one designation, one designation available in Houston-Toluca, and one available in Houston-Los Cabos. United and its regional affiliate ExpressJet hold two designations in Houston-Los Cabos and one designation in Houston-Toluca. As the City of Houston highlighted to DoT in endorsing Spirit’s aspirations to serve Mexico, more than 44% of Houston’s foreign-born population is originally from Mexico, which in the city’s opinion is fuel for more low-fare options to the country. United is the only airline operating from Houston to Cancun; but Mexican low cost airline VivaAerobus plans begin operating in the market during late 2014. See related report: VivaAerobus plans a new transborder push. Is this the start of a new phase for Mexico’s quieter LCC? Spirit told the DoT it aimed to operate three weekly flights from Houston Intercontinental to Cancun from May-2015 to 10-Jun-2015, and then increase its service to daily on 11-Jun-2015. If Spirit pushes forward to launch the service, two low cost airlines and a large network airline will operate in the large leisure market. Given Cancun’s stature as a large inbound tourist destination, it is not clear if VivaAerobus can leverage a huge point-of-sale passenger pool in Cancun. The Mexican low cost airline has operated from Houston to Monterrey for nearly four years, so it likely has some recognition among the Mexican population residing in Houston. Likewise, Spirit is now a familiar brand in Houston, although it has focussed on domestic expansion from the airport, so it remains to be seen if VivaAerobus and Spirit could stimulate enough traffic to support service by each airline. United is the only airline serving Houston-Los Cabos, and presumably charges fares that reflect its monopoly status on the pairing. That could provide Spirit with a stimulation opportunity, and perhaps force United to lower its fares. There is probably ample stimulative opportunity for Spirit, and in a pure leisure market, it will be interesting to see United’s response if Spirit opts to capitalise on its newly gained access from Houston to Mexico. There is no direct service from Houston to Toluca, Mexico City’s secondary airport. But both United and Aeromexico operate service from Intercontinental to Mexico City Juarez airport. Schedules in CAPA and OAG show that for the week of 13-Oct-2014 to 19-Oct-2014 Spirit offers two weekly flights from Fort Lauderdale to Toluca, and it has also previously served Toluca from Dallas/Fort Worth. There could be an opportunity for a low cost offering in the market for Mexicans willing to pay Spirit’s bare bone fares, and try to avoid all the add-on charges for every aspect of the trip beyond the ticket cost. Is Spirit launching a preemptive move against Southwest in Houston? Spirit’s timing in seeking rights to operate from Houston to three Mexican destinations is interesting in light of plans by Southwest to make an international push from a new terminal at Houston Hobby. During 2012, Southwest executed a successful campaign for the terminal’s development, beating back strong opposition from United. Since that time Southwest is close to completing its merger with AirTran, and has assumed some of AirTran’s international service under the Southwest brand. 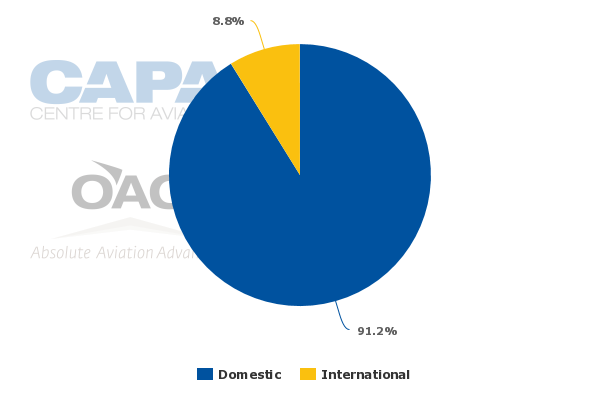 Data from CAPA and OAG show that for the week of 13-Oct-2014 to 19-Oct-2014, roughly 1% of Southwest’s seats are deployed into international markets, compared with 8% for Spirit. Southwest has previously stated that it aims to grow its international footprint to 10% to 15% of its ASMs, and presently its international ASM deployment is just shy of 2%. Nearly 9% of Spirit’s ASMs are deployed to international markets. There are numerous opportunities throughout its network for Southwest to grow its international footprint, and the airline has indicated an interest in serving Fort Lauderdale – Spirit’s headquarters – in addition to Houston. Cancun in particular seemed like a natural market for Southwest from Houston; it already serves the Mexican resort destination from Atlanta, BWI, Denver and Milwaukee. The airline also operates flights to Los Cabos from Denver and Orange County. Given Southwest’s usually conservative style, it seems safe to assume it would prefer to launch its initial round of international flights into markets where it already has an established presence. But Spirit’s potential entry into those markets could drive Southwest to evaluate other markets. Montego Bay is a strong candidate given that Southwest serves the Jamaican destination from Atlanta, BWI and Orlando. Southwest also presently serves Nassau from Atlanta and BWI. Southwest is planning to launch Aruba-Houston in Mar-2015 prior to the completion of the new international terminal; but otherwise has not outlined additional plans for its initial round of new international service from Hobby. Studies conducted by the city of Houston at the time Southwest was lobbying to launch international flights from Hobby projected that the initial six markets Southwest, and perhaps Mexican carriers Volaris and VivaAerobus, would serve include Cancun, Mexico City, Monterrey, San Jose del Cabo and San Salvador. VivaAerobus is sticking to operating from Houston Intercontinental, and Volaris has no plans to launch service to Houston. Obviously Southwest is committed to building an international gateway at its Houston Hobby base, which is its sixth largest measured by seat deployment for the week of 13-Oct-2014 to 19-Oct-2014. But Spirit’s efforts to gain authorisation to serve Mexico from Houston show that Southwest could encounter bumps in replicating the early days of the “Southwest Effect” in international markets given that Spirit has an ability to charge lower base fares than Southwest. Spirit’s threat may be small in Southwest’s larger efforts to leverage its position at Houston Hobby to broaden its international reach; however Spirit’s moves to secure rights to serve Mexico from Houston Intercontinental show that the same threats Southwest faces from ULCCs domestically can easily be replicated in transborder markets. As it works to diversify onto the international stage, the one-time maverick faces the same dilemma – how to differentiate itself from the legacies that look more like hybrid airlines and the ULCCs that are capitalising on the Southwest strategies of a bygone era.